1980 Citroen Mehari. 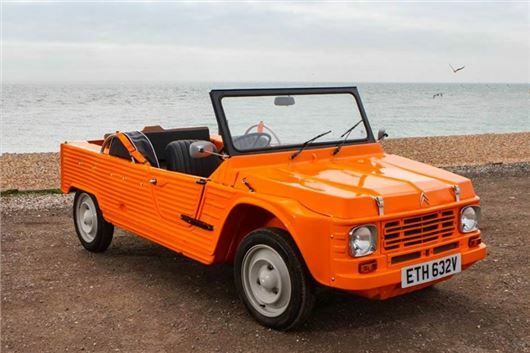 Based on the Citroen Dyane 6 and sharing its longitudinal suspension, the lightweight ABS plastic bodied Mehari was and is the ideal beach car. 144,953 were built. This example was converted to RHD in the UK and fitted with a galvanized steel chassis as part of a £9,868 restoration. Estimated at £10,000 to £14,000. 1960 Aston Martin DB4 SII. One of the most beautiful British cars ever built, this stunning matching numbers RHD example was originally sold to Mr. R. G. Lawrence in Norwich by Aston Martin dealers Brooklands of Bond Street, London on 17th August, 1960. It then went to France and was purchased by its present owner in 2016. The history file has invoice records detailing all work carried out each year from 2016 to 2019 by Aston Martin Works in Newport Pagnell which total £38,942. Even the original clock and radio are in full working order. Estimate: £380,000 to £410,000. 1958 Chevrolet Corvette C1. Historics seems to have become the UK auction house for C1 Corvettes. This ‘58 has the 283CI V8 and rare manual transmission. Imported in 2011 with fully documented minor works carried out since. Est £55,000 to £61,000. 1955 Renault 4cv ‘Bouton d’Or’. Renault’s rival to the VW Beetle, originally developed “in secret”, by the French during WW2. Production began after the armistice and delivery dates ran to 2 years. 750cc engine. This charming example was owned and used by a local chauffeur from Argent-sur-Sauldre in central France and imported to the UK in 1996 where it underwent a bare metal restoration. 65,000 miles recorded. To be sold at No Reserve. 1964 Porsche 356C. Interesting opportunity to acquire a late, road going, very special LHD Porsche 356 SC. Originally from Texas it was purchased as the basis for historic racer in 1997. A full race engine was built by Porsche specialist, Andy Prill, at a cost of £7,400 and the build was based around an original 1600 Porsche engine block. The engine is believed to produce approximately 120bhp but still retains the flexibility required for road use. Further works include; a conversion to a 12 volt electrical system, lightweight aluminium foam filled fuel tank, a dual circuit brake system and a set of 6x15 factory Fuchs alloy wheels. It was subsequently transformed to a road car. Est £42,000 to £52,000. 2011 Ferrari California 2+2 with electric folding hardtop. 4.3 litre 453HP V6. 7-speed DCT. 0-60 4 seconds. Left hand drive. 28,000 kilometres. Originally supplied to Jeddah, Saudi Arabia. April 2019 service by Maranello Concessonaires, Egham. Ready for Summer. Est £52,000 - £57,000. 1970 Alfa Romeo 1750 Duetto Spider Veloce. Classic ‘boat tailed’ and the most desirable 105 Series Alfa Romeo. Spent some years in Gibraltar before being brought back and restored to its original UK registration of AMK 911H. Supplied with a V5 registration document and a year’s MoT certificate together with some invoices. 70,614 miles. Estimated at £28,000 to £34,000. 1927 FIAT 503 12HP 3-seat Torpedo. During the 1920s, to save on UK import duties, FIAT of Turin supplied the chassis units only to FIAT (England) Limited, to be bodies in the UK. This one arrived in February 1927 and was bodied by FIAT’s own ‘Railways Materials Department’, in Ashford, Kent. Recent improvement include new Triplex windscreens. Along with it current UK V5C registration document, this Fiat comes with two continuation buff log books from the 1950s and records that the car was first registered on 29th September 1927. Est £12,000 to £16,000. Sale at Mercedes Benz World, Brooklands, Weybridge on Saturday 18th May 2019. Starts 10.00am. Viewings Thursday 16th May 2019 10am - 8pm; Friday 17th May 2019 10am - 5pm. Entry by catalogue, price £30.